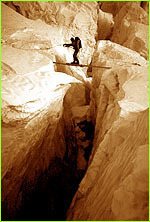 In 1950, western mountaineers approached Everest through Nepal, rather than Tibet, and saw for the first time the formidable Khumbu Icefall which constitutes the mountain's southern defences. The formerly sequestered and roadless kingdom of Nepal had only just opened up to outsiders in response to internal and expernal political pressures. Mountaineers, map-makers, geographers, ecologists, and ethnologists rushed to take advantage of the new situation. 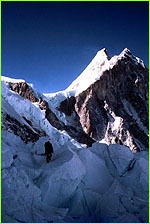 H.W Tilman joined Charles and Oscar Houston on the first trek into the Solu Khumbu, home of the Sherpas. Gazing at the Khumbu Icefall as it tumbles between the buttresses of Nuptse and the West Shoulder of Everest to the valley floor, Tilman was not at all optimistic that this offered a feasible route to the summit. Yet there was no other way to gain the Western Cwm and southern slopes of Everest. For him personally, the obvious hazards were more than he was prepared to accept. Back in England, however, Michael Ward was urging the Everest Committee of the Royal Geographical Society and the Alpine Club to mount a reconnaissance of these southern approaches to see if they gave access to the South Col and the southeast ridge of Everest. Technological advances in clothing and equipment had been made during the war, and more was known about high altitude physiology. Also, more was known about the mountain itself, which by now had been flown over several times by airmen. Based on new topographical information, the Royal Geographical Society was hard at work on a map, and gave an advance dyeline to Eric Shipton, who had been put in charge of the proposed reconnaissance. The small exploring party, which set out in the summer of 1951, comprised, besides Shipton and Ward, the Scottish mountaineer W.H. Murray, Tom Bourdillon, an Indian geologist E.A. Dutt, and two promising young New Zealand climbers, Ed Hillary and Earle Riddiford. A group of Shipton's favorite and trusted Sherpas including Tenzing Norgay rounded out the party. Monsoon conditions during the trek in meant it was the second half of September before the group reached Namche Bazaar in the heart of Sherpa country. On the last day of the month they made their first foray into the Icefall. This wild tangle of troughs and pinnacles, which can move downhill by as much as a meter a day, is continuously unstable, and often swept by ice avalanches. No route through it can be guaranteed, which makes each passage a new adventure. Climbers might take this risk in their stride, but there was considerable unease about exposing laden porters to this threat over and over as they ferried loads to higher camps.